Oak and beech smoked, Wiltshire cured rindless back bacon rashers with added water. 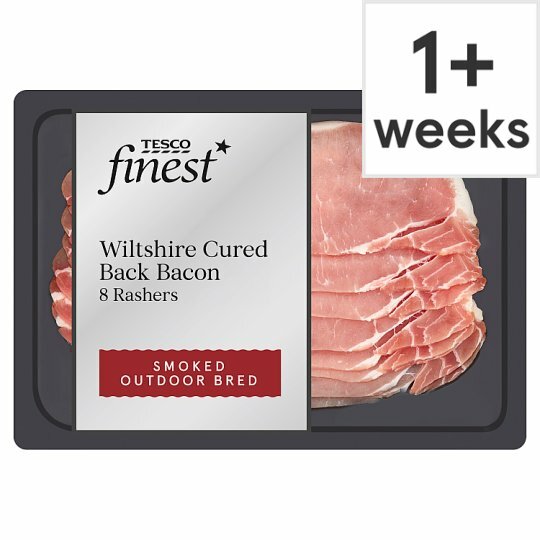 Our Tesco finest* Wiltshire cure bacon comes from British outdoor bred pigs, which give tasty, succulent pork. Our experts cure the meat by steeping it in an aged Wiltshire brine for a distinctive salty taste and succulent texture. INGREDIENTS: Pork (89%), Water, Salt, Preservatives (Potassium Nitrate, Sodium Nitrite). Instructions: For best results grill. Place under a pre-heated grill for 4-6 minutes. Turn occasionally. Instructions: Fry in a little oil for 3-5 minutes, turning occasionally. Drain well before serving. Defrost thoroughly for a minimum of 6-8 hours in the fridge.